Welcome to this first week of I Heart Macro with me as host. Thank you to creative and kind Lori Plyler for the honor of allowing me continuing this wonder-filled meme. I've never been a meme host before so please be patient as I figure out the process. I will do my best to visit your blogs when you link up, but as you know if you are a regular follower of my blog, sometimes I just don't have the energy to respond to everyone who visits, (MS lassitude has a way of sneaking up on me) so the same will be true for participants of I Heart Macro... AND I will make my best effort to connect with you as I am able. The meme will be open from Saturday's at 8pm EST through Monday's at 8pm EST. Please link back to my blog either using the button Lori so generously provided (html code is in the box below the button) or by just linking the words "I Heart Macro" back to my blog using this link: shinethedivinecreativityisaspiritualpractice.com, particularly if you like to participate in several memes with a single post as I often do. Feel free to include poetry, prose and thoughts your macro photo or series inspire(s) in you. Writing is completely optional for participation however. Straight out of the camera, edited, color, black and white; all are welcome as long as you bring the viewer near to whatever it is that attracted your heart and woke up delight. Technically I don't have a "macro" lens, although my Lumix DMC-LX5 is excellent at close range, so don't feel like you can't participate if you don't have fancy equipment either. So, enjoy slowing down with your camera, paying full attention, observing beauty and curiosities many people pass right by. Your generosity of spirit and keen eyes might just open the door to miniscule miracles and mirth others would not have access to otherwise. I'll change the link on my meme list Laura -- I don't have a macro today, but will definitely keep you in mind next week. Beautiful web! I'll bookmark and try to remember your meme. . .I do (heart) macro. 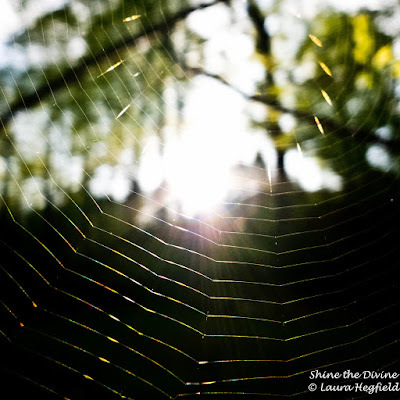 A web definitely does shine if light hits it in the right way! Gorgeous pictures. I really love the colours you've captured. Great haiku and pics. Good look with the meme. Love the spider web. That spider must be OCD. It looks perfect! I am happy to read about Ellie and to know she is still with you. She is well loved and dear. Bless you for taking such good care of her. This rainbow web is fantastic ! LOVE the web! I think they are so cool to take pics of when they have the dew on them! Thanks for taking over. I have missed it! I like spider webs as much as water drops :-) If you want to combine the two and don't want to wait for a damp morning, fill a spray bottle with water and mist the web, viola! I am so glad you revived this meme! Love your web. 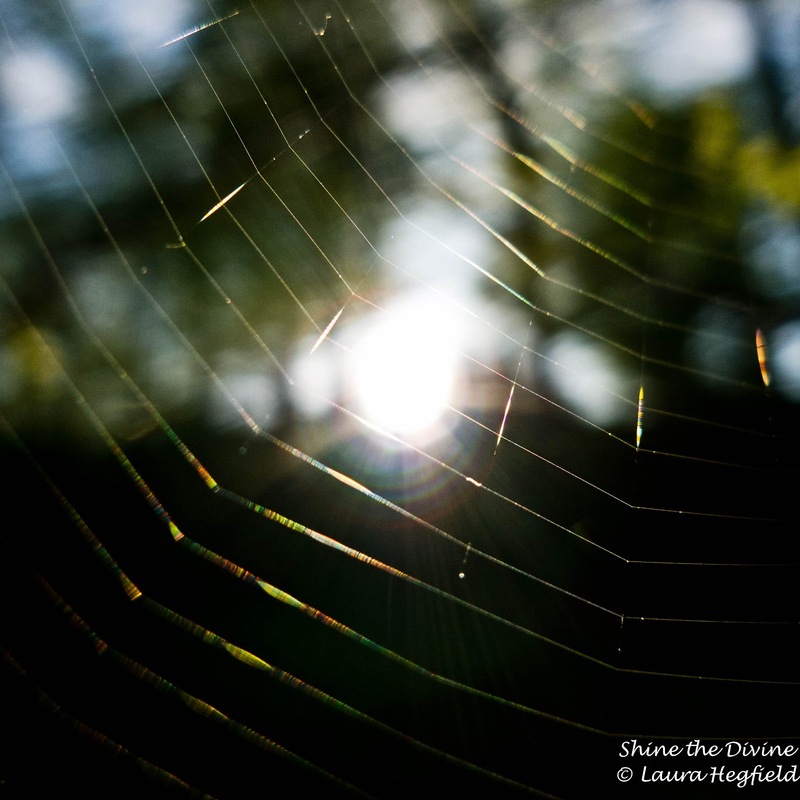 Love the way the light plays on the silken web. Great capture of the spider web. I'm visiting from Macro Monday and will try to remember to join you as well. The pictures are amazing but the haiku is awesome. Thanks for visiting my blog. Beautiful images and a great quote Laura. I have just joined your link party, found the link on another site I visit. Your spider web photos are wonderful. Great capture of the spider web! Like the quote too! so much intimate close up beauty! you will be a lovely host laura! i must remember to visit you saturday evenings and watch the beauty unfold! There is something infinitely beautiful in a spiderweb. Good luck hosting this meme. oh it is your first week! i will join in some time. such wonderful photos Laura. Beautiful Pics! Sorry I entered twice ,I didn;t see my entry the first time. Oh, I didn't know you were hosting Laura! Great, I'll be sure to join in next week! Best wishes for hosting the i heart met me. Doing a popular meme is a lot of work. It looks to be a success. Thank you for visiting my poem blog for Open Link Monday. I am sorry for being so late in returning here.